The Long Beach area of the Washington coast is my favorite. When I was younger, my family and I used to go there often. It was a 90 minute drive from our house, and the salty air called on a regular basis. It was so much a part of us, that my mom wanted to visit it multiple times toward the end of her life, and after she passed it was too painful to go back just to visit. But then my friend Erin Ashleigh got in touch with me. 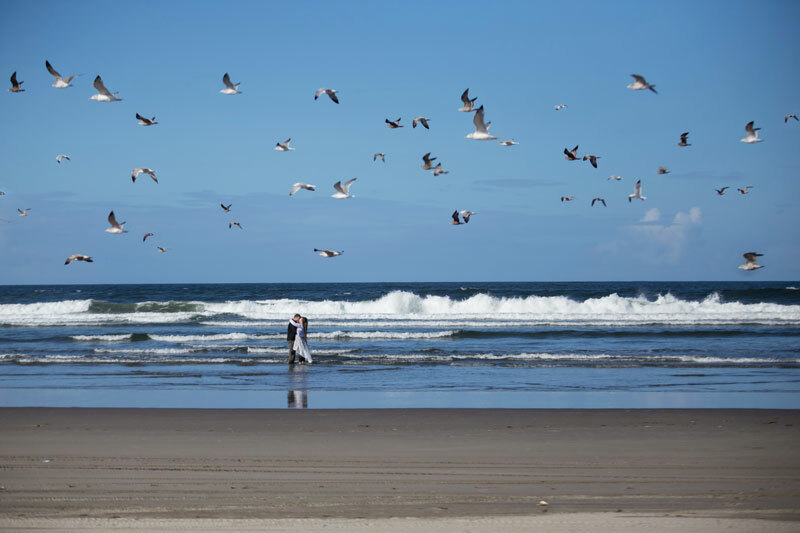 She was getting married, and her fiance Loren and she would be saying their I dos on the sandy beaches of Ocean Shores – a few miles up the uninterrupted shoreline from Long Beach. And I was thrilled. I not only had a reason to pull me back to the beach that I loved so much, but it was to share in the happiest of happy days for a friend. A day filled with love, and smiles; warm sun, and crashing waves; and lots of gorgeous photo ops. Their ceremony was short but heartfelt, as they stood barefoot in the sand between a bonfire and the ocean. Their first kiss was quickly followed by a run to the waves. Erin Ashleigh said it was like a foot baptism for the ceremony, and it was a beautiful ending moment. I will forever be grateful to Erin Ashleigh and Loren for asking me to be a part of their day – for so many reasons. Check out their awesome photos!